Summit, NJ, September 21, 2018 — The good news: healthcare marketers are working hard to personalize their content and the user experience as effectively as do Amazon and Netflix. The bad news: healthcare marketers don’t often succeed, but this situation will improve courtesy of an upcoming gathering of healthcare marketing leaders. 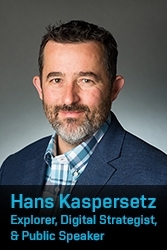 On September 27 at Marketing Health: The Conference, in New York City, Arteric President and Chief Strategist Hans Kaspersetz will join other digital marketing thought leaders to help healthcare marketers accelerate their personalization programs. Mr. Kaspersetz will moderate a conference panel titled “Paging Dr. Data: Driving Better Relationships With Smarter Segmentation.” Panelists will share insights on how to overcome hurdles to high-resolution segmentation such as aggregating, managing, and sharing brand data; navigating regulatory issues; and effectively applying analytic methodology and technology. Marketing Health: The Conference, presented by MediaPost, is a leading annual event where marketers from across the healthcare delivery continuum (big pharma, hospital networks, health insurance, and senior care) meet to share and analyze the latest trends in healthcare digital marketing strategy and technology. The panelists include Dr. Gabrielle Bedewi, Chief Analytics Officer, Butler/Till; Brian Deffaa, CMO, LifeBridge Health; Justin Freid, EVP, Managing Director, CMI/Compas; and Shonel Morrison, Associate Director, Media, AstraZeneca. For two decades, Arteric has combined data-guided, experience-driven insight to create competitive advantage for pharmaceutical brands, biotechnology brands, and healthcare organizations. Contact Hans Kaspersetz at 201.546.9910 to advance your brand with personalized marketing solutions that work everywhere, every time. Arteric is a pharmaceutical and biotechnology digital marketing agency renowned for its expertise in digital brand strategy, software engineering, data, search engine optimization, search engine marketing, CRM, and analytics. Arteric is the digital agency that will propel your clinical trials recruitment, premarket shaping, disease state education, brand launch, or brand revitalization forward with digital insights and execution that cannot be matched.